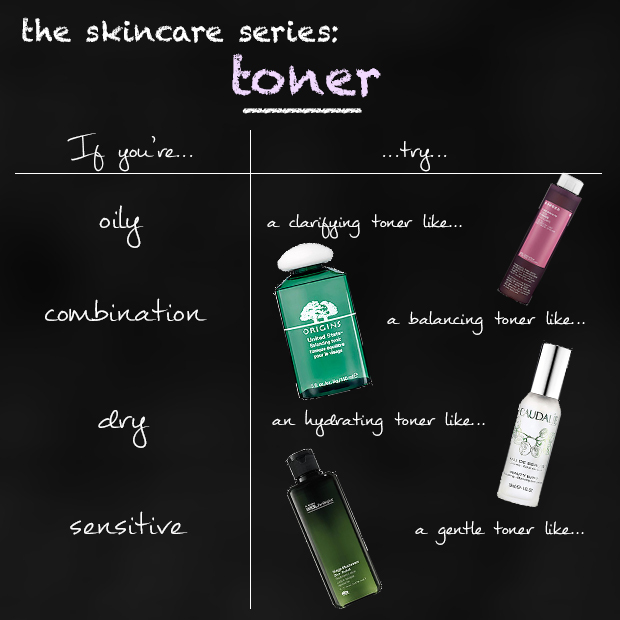 The Skincare Series: Toner – amandarobots. The next step in a complete skincare regimen is toner. I’ve blogged about how important toner is, and I also mentioned that it’s important to choose a toner that’s made for your skin type. That’s not easy though, so here are some tips to get you started! If you have oily skin, look for a mattifying and clarifying toner. Plain witch hazel from the drugstore makes a really good astringent toner for oily skin. When my skin was super oily this past summer, I used Korres Pomegranate Toner. It worked really nicely for me, is natural, and comes in a really big bottle for the price. If you have combination skin, look for a balancing toner. Like with cleanser, you want something that is going to deep clean oily areas and hydrate dry areas. It sounds like an impossible balancing act, but I find that Origins United State toner* works really well. I’m on my second bottle! It’s a common misconception that if you have dry skin you shouldn’t use toner. Really, you just need the right toner – ideally one that’s hydrating and has a very low alcohol content. This Caudalie Beauty Elixir is a mist that you can leave on the skin – no cotton pads necessary! It actually has nourishing oils in it that will help to hydrate your skin. If you have sensitive skin, you’ll want a very gentle, soothing toner. The Doctor Andrew Weil for Origins Mega-Mushroom toner is designed to soothe the skin and reduce redness and inflammation. You’ll want to use a very soft cotton pad to apply it, like the Shiseido ones. If you still find that cotton irritates your skin, try decanting the toner into a spray bottle and spritzing it on. Remember, skincare is partly trial and error. I recommend getting a few toner samples and seeing which works for you! I agree about the importance of toner. I never used it before and was surprised how much Ick still came off my face after cleaning. I have sensitive skin that is dry in the winter, normal in the summer. I use Paula’s choice skin recovery. It it’s soothing, a game changer for me. Really reduced redness. Exactly! I used to think that toner was just another gimmicky product. But what really convinced me was when I used it and saw the dirt on the cotton pad. I couldn’t believe that all that was left on my skin! I’ve never seen Paula’s Choice before – I’ll have to keep an eye out for it!